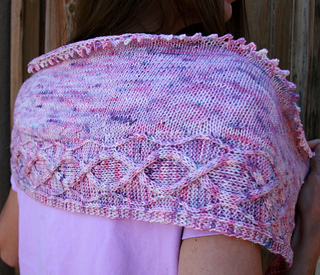 This elongated crescent-shaped shawl is knit beginning with the cabled border, which is worked back and forth. Stitches are then picked up along the upper edge and the rest of the shawl is worked in Stockinette Stitch and shaped with short rows to form a subtly curving shape. The top edge is finished with a picot bind-off. Note that the cabled border is presented in chart form only. Suggested skills: Knit/purl, decreases, basic chart-reading skills. The yarn for this project was dyed for the Jimmy Beans Wool November Microbrewed Harry Potter themed offering. It is available through their website in mid-November here.